Do you have so many lipsticks you don’t know where to put them? An overflowing bag of mascara, blush and foundations? Enough brushes to deck out the biggest bridal party? If you answered yes then you my friend need some makeup organizers. My husband is constantly nagging me about my bathroom organization skills, or lack thereof. I try my best to stay organized but the problem is I just have SO. MUCH. STUFF. Over the last few months I’ve purchased a few super affordable yet highly functional makeup organizers. Today I’m going to share my top 5 so that you too can have a more organized space. 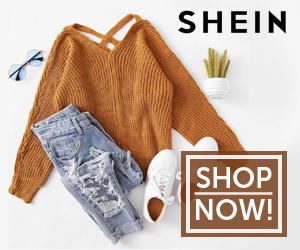 *This post contains affiliate links which means I may make a small commission if you make a purchase, at no extra cost to you. Clear Acyclic Display Organizer – What a life saver. Ok, maybe not a life saver but you get the point. 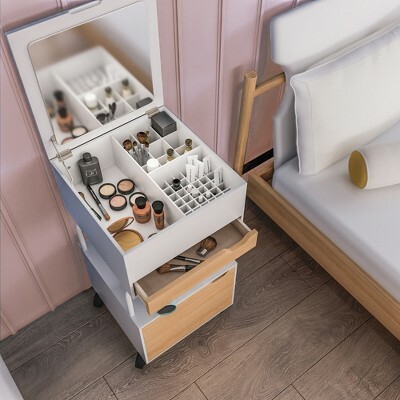 With small compartments for lipsticks, and drawers for compacts, you’ll no longer have to go digging through your makeup every time you want to find something. I like using the larger compartment for foundations/sprays, the smaller ones for lipsticks and pencils and the drawers for compacts. Being able to see everything just makes it so much easier. Cosmetic Tray – These are great for those who don’t like their belongings displayed on the counter or for the things you don’t use very often… Or for those who have so much stuff they need a counter AND in-drawer solution. I like putting my samples, blenders and miscellaneous pieces in these so they aren’t an eye-sore on the counter. Spinning Cosmetic Organizer – Another great counter option, just a different style. These allow space for bigger things like eye makeup remover and perfumes. This one comes in white and black so if you’re not a fan of the clear options this one will also go with most bathroom designs. Door/Wall Mounted Organizer – If you don’t mind spending a bit more money this organizer is the way to go! It has an LED-framed mirror, shelves, 1 flip-down shelf, lipstick holders and more. It can also be used mounted to the wall, has hooks for necklaces and a zippered pouch for more delicate/valuable items. Beauty Cart – Ok, I know this one is a big ticket item but it’s so good I HAD to add it to the list. If you don’t have a large vanity or a lot of closet space this cart will be your BFF! With 20 small compartments, 9 medium compartments a mirrored lid, shelved nook and casters this baby has it all. I’m just guessing it can also double as a night table?! Do you have any makeup organizers you love? Drop it in a comment below! 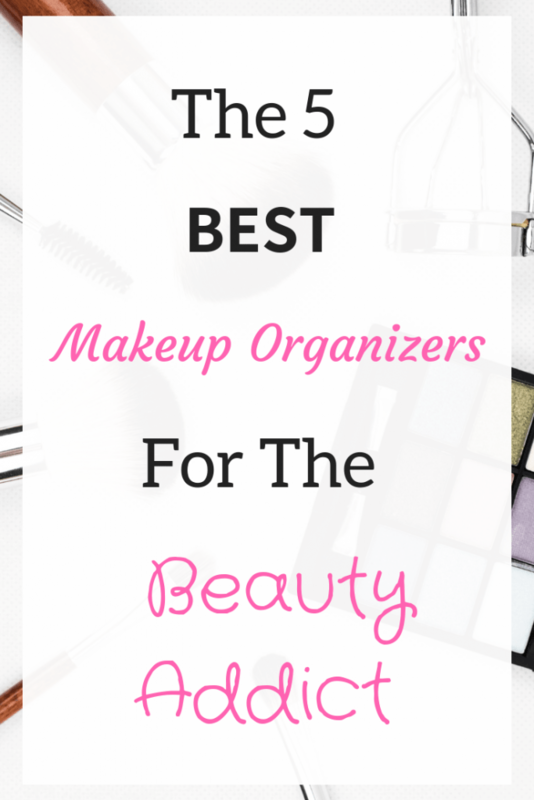 Save this “The 5 Best Makeup Organizers” post on Pinterest via the image below. I have all my makeup in little bins in my top drawer in the bathroom. My girls love organizing it and going through each one so it stays pretty clean! Yep! Our daughter does the same over here and it’s pretty helpful lol!